Tue, 29 Jul 2008 | Published in I Was There . . .
Akoya Afrobeat Ensemble brought their gargantuan afrobeat sound to Southpaw and turned the packed house into a dancing frenzy. Featuring 13 musicians from six different countries, Akoya is notorious for bringing insane amounts of energy to their live shows. Akoya has a diverse array of musical influences and voices that resonate in their live presentation. They accentuate the many different elements Fela incorporated into his original afrobeat sound: a tight, large horn section, beautiful female singers and dancers, multi-layered rhythm section, and a captivating front man singing call and response lyrics. 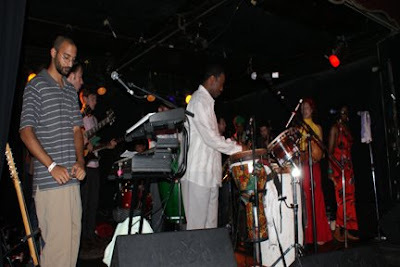 Front man and lead singer Kaleta, who toured with Fela and Egypt 80, makes a very distinct imprint on the band as a percussionist and singer in Akoya. The biggest element he brings is his onstage energy, engaging the crowd with his character. Akoya Afrobeat Ensemble is one of the most underrated Afrobeat bands on the New York scene. With a monstrous horn section, tight percussions, and captivating vocalists, Akoya is a force with which to be reckoned.